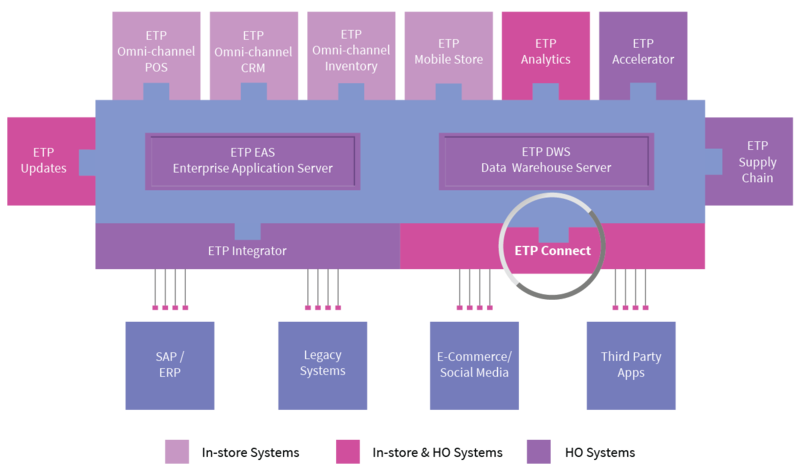 ETP Omni-channel Connect is a web services middleware which bridges the online and the offline world by connecting the ETP V5 Suite with e-commerce and social media channels and with third-party applications. ETP Connect empowers retailers to use the robust and time tested business logic and web services of the ETP System to connect their systems in real time with other systems in this digitally integrated world. For example, ETP Connect could help in customer creation across channels to have a common Customer Master, in pushing promotions from the ETP Accelerator to the e-commerce portal, in pushing e-commerce sales into ETP V5 so you can have a centralized repository of sales and in offering an omni-channel experience to your end customers. So they can order online and take the pick up from the nearest store or order in-store and have the product delivered to their preferred location. Thus it enables connecting your business to customers, partners, payments systems, e-Commerce sites and anything else you would need as a retailer.